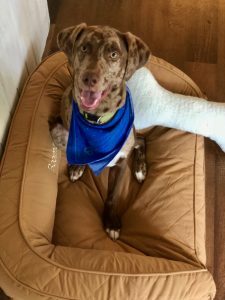 “Boomer”, an energetic, three-legged Catahoula Leopard dog, came to Brother Wolf Animal Rescue of Asheville, NC in a unique package deal. Brooke Fornea, Brother Wolf employee, was driving through Alabama on her way to a family vacation in Mississippi when she spotted a stray dog in the middle of the highway. Soon discovering that the county’s local animal control was full and wouldn’t take him, she called around to find the nearest no-kill animal shelter. With only one in the area, they advised they were completely full but agreed to take in the stray for two weeks – contingent on Brooke coming back after her vacation to pick him up along with four more dogs. Brooke enjoyed her family vacation knowing the stray was safe, and once she was back in Asheville she picked up a Brother Wolf van and headed straight back to Alabama. She brought all five dogs back to Brother Wolf – one of these was Boomer. Shortly after Boomer arrived at Brother Wolf, he was adopted. His new owner immediately fell in love with his beautiful spotted coat and courageous personality. Despite being under-socialized and missing a leg, Boomer is now an adventurous year-old pup with a heart of gold.